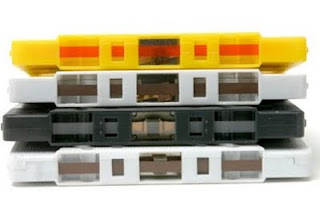 While we are all familiar with the difficulties in making a mix tape/cd (I'm old school, I still shudder at saying "mix cd"), there are also the difficulties of interpreting the mix tape, urgh, cd. While many have written about the art of making the mix (see Hornby quote below), I'm wondering about the countless hours that the recipient spends in analyzing the content of the received mix. Certainly, some mixes are not intended for a purpose, while others are created with the intention of communication. Then there is the case where you receive a mix that you haven't a clue about. Last weekend, through a series of happenstance decisions, I ended up (at a very late hour) in a neighbor's home that I had only briefly met. Okay, I'll level with you. I ran into her in the local bar (though, I also have decided today that it sounds much better to refer to them as pubs--thanks, Art!). She invited me and my next door neighbor back to her house for a night cap. Upon arrival, we discovered our new friend is a DJ. She proceeded to play us music while we ruminated on life, love, and work. I should also mention we spent an inordinate amount of time on a letter her doctor wrote her excusing her from work, but I digress. Toward the end of the evening, our lovely host decided that both my neighbor and I deserved a mix cd of her making. She set out to make a mix for my neighbor, Ashley, first. In what seemed like an extremely long process of selection, she finally burned a cd for Ashley. I thought we were in the clear- in that I assumed she would quickly burn the same copy for me. But no, I would be wrong. She informed me that I needed a different mix and a different order. In what felt like another hour, she re-ordered the cd and proceeded to burn it. I feel ashamed to admit, but I didn't actually listen to this cd until this week. And while I appreciate the genuine time and energy that went into this project...I'm just captivated by the song choice and the order. Track 6- She wants to move- N.E.R.D. Wait, Soundgarden? The Zombies? Were these put in a strategic place simply because she thought it might communicate something I needed to know? Or did these two songs simply find a placement based on what she thought she knew about my musical taste? And Soundgarden? Really? I hope I don't communicate that to people. All of that being said, I love the mix. It serves as a relic of an evening. And I actually enjoy many of the songs, well, except the Soundgarden song. I have this thing about listening to new music. People send me a mix or a new album and I tend to comment, "I need a good road trip to really engage with the music." Even when I make inappropriate late night iTunes purchases, I generally need some time on the road (read: long road trips) to feel like I've fully engaged with the album as a whole. The other night (thanks to Jenn's post about listening to vinyl), I decided to spend some time with my music collection. I put an album on and I simply sat in my latest furniture purchase (a red swivel Lazyboy, which has now been claimed by a cat) and listened. I just listened. It was then I realized how few and far between I just sit and listen to music. I feel like I use to do this all the time, but now I listen to music while I'm writing, driving, working. It becomes background, as opposed to front and center. It felt nice to just dedicate time to listening, really listening. 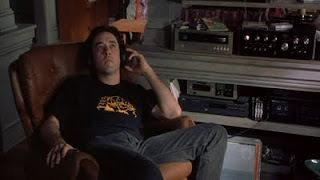 So, here is my suggestion- find one night that you can just sit and listen to albums or mp3s- but just pull out some music and listen to it. I swear it feels different. And I miss it. Perhaps I should steal my new chair from Sabine (the cat) and move it next to the record player. While I'm still processing my first trip to the ASA conference in San Francisco, I do have some photos to share. Now, you might be wondering- where are all the pictures of the conference? Trust me, pictures of conference presentations and a lobby filled with sociologists talking, networking, job hunting (all while running on only a handful of hours of sleep each night)- would not have been as interesting as the pictures I collected of street art and drinks. Trust me. So, here you are. Some pictures. And a lovely video from my last night at Johnny Foley's with Bobby, Lauren, Danielle, and Edson. While you can hear Edson asking a question, Bobby asking if I'm going to blog about this, then running in front of the camera- you can also carefully overhear someone making the statement, "I said, you are married and I have a boyfriend." Where was that conversation taking place? When I thought about songs that remind me of San Francisco, I immediately thought of David Dondero's "Double Murder Ballad Suicide." While I failed in finding a version of the song to share with all of you- I suggest you listen to it. Now. And here is a video I found. Two of my favorite people involved here- Bob Boilen and David Dondero. I had the chance to interview both in the last couple of years for the Music is Memory project and can honestly say they are both very lovely people. More to come on this at a later date. Enjoy.